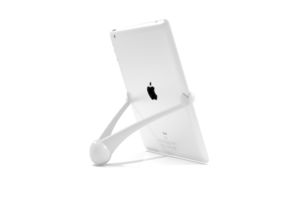 If you’re looking for an iPad stand, you face a plethora of options and possible features. 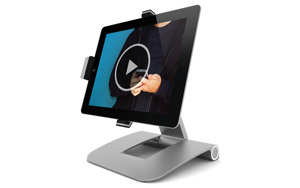 Will you be using the stand to hold the iPad for FaceTime and video viewing, or will you just be surfing and typing? Do you need to be able to prop up the iPad in both portrait and landscape orientations, or will one or the other suffice? Is one position enough, or do you need a stand that adjusts to multiple angles? 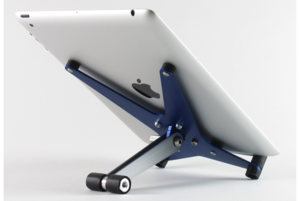 Do you need a stand that will accommodate an iPad in a bulky case? But perhaps the most important characteristic of an iPad stand is whether it’s made to stay on your desk or to be carried with you. I tested seven portable iPad stands small enough to fit in your laptop or tablet bag. Maximo’s $50 iU-AS1 iUp Anodized Aluminum Stand (3.5 of 5 rating) is constructed of brushed aluminum with nonskid silicone feet and protective silicone cushioning everywhere the iPad comes in contact with the stand. 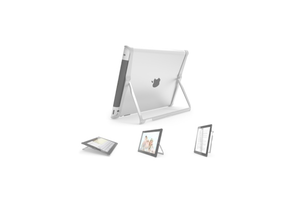 The iUp works with any iPad model, bare or in a slim case, and in landscape or portrait orientation. The iUp feels quite sturdy, and I was able to tap and type on the screen without fear of it toppling over. The stand consists of two pieces that you can assemble in two different ways to get different angles: roughly 45 degrees or a more-upright 60 degrees. The former is comfortable for on-screen typing, while the latter is good for video-watching or working with an external keyboard. All of the iPad’s ports and buttons are accessible while you’re using the iUp; a cutout at the bottom lets you charge and sync your iPad even in portrait orientation. At just 11.7 ounces, the iUp is lightweight, and, when disassembled, its two pieces nest together to take up less space in your bag. The iUp comes with a thin pouch that fits both the stand and an iPad, but the pouch looks and feels cheap. The company also offers, as a separate purchase, an adapter for car and wall mounting. The iUp doesn’t do anything fancy, but it’s sturdy, lightweight, portable, and attractive. 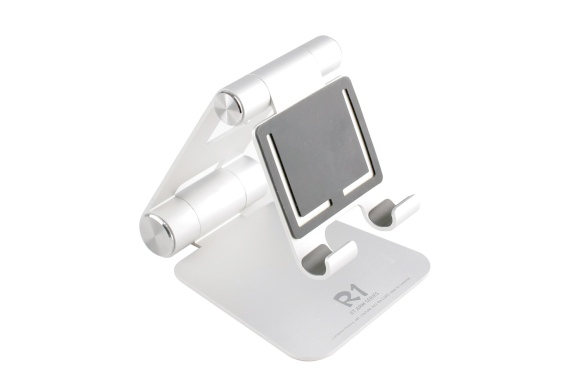 Satechi’s $50 R1 Arm Hinge Holder Stand (4.5 of 5 rating) is constructed of brushed aluminum and has not one but two hinges. A thin layer of silicone on the bottom—and any spot the iPad would touch—prevents slippage and scratching. The unique design lets you use your iPad in landscape or portrait mode. Any model of iPad fits, including an iPad in a thin shell case. Once in place, your iPad feels quite sturdy, handling tapping and typing without much shaking. The R1 also works great for browsing the Internet, watching videos, and video-chatting. All ports and buttons are fully accessible. You can position the R1 to hold your iPad at every conceivable angle, from totally flat to completely vertical. And the stand works well if you use your iPad with an external keyboard. What really makes the R1 special is its design and Apple aesthetic. The moment I plopped my iPad into the R1, I had the sensation of looking at a tiny iMac. The shiny hinge ends even resemble the ends of Apple’s wireless keyboard. The R1 folds down flat, with no disassembly required. It comes with a thin, velour drawstring pouch to protect it—and, perhaps more important, your other gear—when you toss the stand in your bag. At 12.5 ounces, it’s a bit heavier than the iUp, but it’s still quite light for a metal stand. With its sharp looks and infinite angle options, you can’t go wrong with the R1. Kubxlab’s $30 Mona iPad Stand (3.5 of 5 rating) is a plastic stand that’s very small when folded, so it’s especially portable compared to metal stands. In fact, it’s barely larger than a pencil with a walnut on the end, letting it fit into even a small purse. However, the Mona’s tiny size comes with trade-offs. For instance, you attach the Mona to the sides of your full-size iPad—it doesn’t work with the iPad mini—using tiny, handlike grips, and the fit on my third-generation iPad was so tight that the grips actually pulled up the edges of my iPad’s protective screen film. The Mona lets you prop up your iPad in portrait or landscape orientation. In the latter orientation, however, the Mona’s grips, which can be attached only along the iPad’s longer edges, make the iPad tilt to one side or the other slightly. This may not bother you, but it did bother me. Alternatively, you can lay the Mona flat on your desk and rest the iPad on top of it for a low typing angle, but in this position the iPad is resting loosely on the stand. The tablet won’t fall over if you tap on its screen, but if you tap too firmly too close to the edge of the screen, the iPad will fall to the side. The Mona is really optimized for portrait orientation, which it handles nicely and at a multitude of angles—you choose the angle by positioning the grips higher or lower on the iPad. The Mona itself doesn’t block any of the ports or buttons, but since the iPad rests on its own bottom edge while propped in portrait orientation, you won’t be able to access the tablet’s Lightning-connector or dock-connector port for charging or syncing purposes. Kubxlab claims the Mona is designed for use with the original iPad or the iPad 2, but it should work with any model. However, because it grabs the edges of your iPad, the Mona doesn’t work with an iPad in a case. The Mona is more cute—cheeky, even—than elegant, and it’s super-portable. However, I recommend it only for someone who needs to set up their iPad primarily in portrait orientation. It might also also make a good supplement to Apple’s Smart Cover, which can prop up an iPad only in landscape orientation. The FrameShift folds flat for storage and can be configured for any angle from completely flat to 90 degrees by simply moving the back arm. My iPad felt quite sturdy in the FrameShift, whether in landscape or portrait orientation—you won’t tip it over with even vigorous onscreen tapping. All buttons and ports are fully accessible, and the stand is open enough at the bottom, and raises your iPad enough off your work surface, to allow you to connect your charge/sync cable while the iPad is in place. However, the stand won’t accommodate an iPad in a case. While the FrameShift doesn’t have any bells or whistles, it’s a solid contender: It looks sharp, weighs little, holds your iPad securely in most any position, and allows full use of the iPad for multiple purposes. The major downside to the FrameShift is its price: It’s double that of the next-most-expensive models here, and many times the price of the cheapest. The least expensive, smallest, and lightest stand in this roundup is the $15 WingStand (3.5 of 5 rating). It’s actually two separate, tiny pieces of plastic—available in white or black—cleverly designed to snap together for storage and small enough to slip into your pocket. 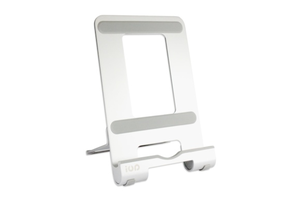 Pull the two pieces apart, and they form two “feet” that hold your iPad (or iPhone or iPod touch) in portrait or landscape orientation at a single, roughly 75-degree, angle. Used alone, the WingStand can prop up an iPad for screen viewing, though it’s not sturdy enough for for you to tap the screen in this position. Its true purpose is as a stand for using Apple’s Bluetooth Wireless Keyboard with your iOS device. The WingStand’s two pieces are designed specifically to clip onto the round, rear edge of that keyboard—once you snap or slide the two pieces onto that cylinder, you get a very secure stand for your iPad or iPhone. When your iPad is sitting in the WingStand, all the tablet’s buttons and ports are accessible—unless the iPad is in portrait orientation, in which case the keyboard blocks the iPad’s Lightning- or dock-connector port. 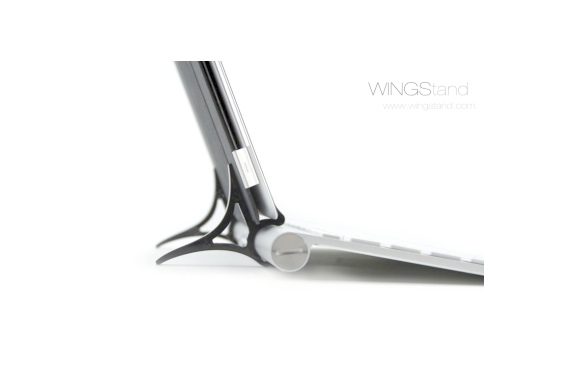 The WingStand’s fit is snug, so don’t count on being able to use the WingStand with an iPad case. Of course, the biggest limitation of the WingStand is that it works only with Apple’s keyboard, which makes the stand a bit of a one-trick pony: I recommend it only if you plan to type frequently using Apple’s Wireless Keyboard. If you fall in that select group, the WingStand’s low price and ultra-portability make it a winner. Rain Design’s $50 iSlider (4.5 of 5 rating) clearly aims for the Apple aesthetic. Its packaging looks much like that of an Apple product, and when folded up, the stand bears a passing resemblance—shape-wise—to Apple’s Magic Mouse. When you first take the iSlider out of the package, the entire thing appears to be constructed of Mac-style brushed aluminum, but once you open the stand, you can see that the metal part is the base, while the rest of the stand—which stores inside the base for travel—is black plastic and metal. The stand weighs in at just 8 ounces. Slide out that black part, and you then lift the back section of the stand (the part that supports your iPad) on its hinge until the back is at the desired angle. You then slide the back section in toward the base until the former rests on the latter for support. The rear surface of the back section is ridged, which allows you to position that section at over a dozen different angles ranging from about 20 degrees (nice for onscreen typing) up to roughly 80 degrees from horizontal. The iSlider easily accommodates any model of iPad, including the iPad mini, in either landscape or portrait mode. One of the iSlider’s advertised features is the capability to hold your iPad while it’s encased in Apple’s Smart Cover or Smart Case. The stand even comes with a silicone adapter for each to ensure a custom fit. This extra space also accommodates other slim-to-medium cases. The downside of this approach is that a bare iPad is pretty loose in the iSlider. This may not bother you, since the iPad still feels secure, but if you do a lot of hard tapping toward the bottom of the screen, the iPad can wobble a bit. 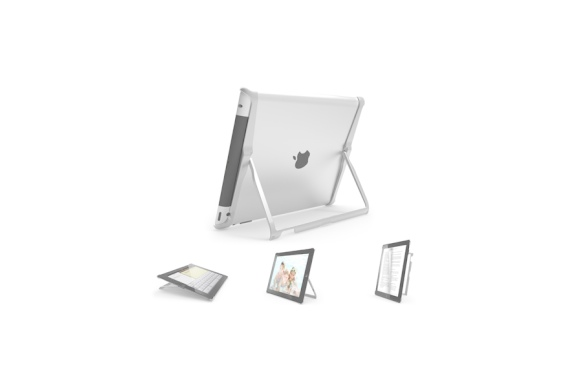 The iSlider works well with an external keyboard, and all connections and buttons are freely accessible; a special cut-out at the bottom of the iSlider’s cradle even allows you to connect the iPad’s dock/sync cable. Rain Design includes a form-fitting, faux-leather carrying pouch. As long as you don’t mind a bit of wiggle room, the iSlider is a solid portable option. If you want light and portable, it doesn’t get much lighter and more portable than HumanToolz’s $50 Mobile Stand for iPad (3.5 of 5 rating). This slim, 2.5-ounce frame snaps onto the back of your bare, full-size iPad. It’s made of an aluminum alloy that matches the back of the iPad. The stand is compatible with Apple’s Smart Cover but is fully functional without it. Once the frame is in place, simply swing out the arm on the back to place your iPad nearly upright (at a roughly 85-degree angle) in portrait orientation. Alternatively, you can use your iPad in landscape orientation at any angle from about 30 degrees (for on-screen typing) up to about 85 degrees (for screen viewing), though the stand is most stable at lower angles. And if you want your iPad to rest totally flat, you just fold the Mobile Stand flat against the back of the tablet. With the stand attached to your iPad, all buttons and ports are fully exposed—even the camera is unobscured. In portrait orientation, however, the bottom of the iPad rests on your work surface, so you won’t be able to connect your charge/sync cable. In my testing, the Mobile Stand worked great with an iPad 2. However, even though the company’s website claims that the stand should also fit the third- and fourth-generation iPads, I was unable to get my third-generation model to fit into the stand properly. Even when I tried to (gently) force it to fit, I couldn’t get the stand to snap into place—I could use the stand, but only three corners would hug the iPad at a time. 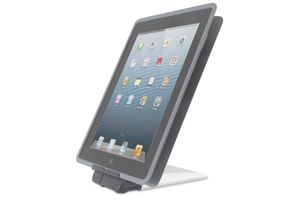 If you have an iPad 2, however, the Mobile Stand is a perfect fit and a solid stand. With computing and computing accessories, you must often make a trade-off between portability and functionality. The least-expensive options I tested, the $15 WingStand and the $30 Mona iPad Stand, both plastic, take up the least amount of space in your bag. But they’re also the least flexible in terms of how you can use them. Still, if either of them does everything you need in an iPad stand, they offer great value. If, on the other hand, you need a greater range of positions and angles, or a sturdier construction, you’ll want to step up to one of the metal options. If it weren’t so much more expensive than the others, my personal favorite would be the FrameShift for its light weight, elegantly spare form, and flexibility. But as much as I like it, I can’t say that it’s twice as good as the others. For $50, Satechi’s R1 is just as solid, flexible, and attractive (if in a different way), though it’s also a bit heavier. HumanToolz’ Mobile Stand is lightweight and flexible, but it fits only the iPad 2 well. For me, the best overall blend of value, weight, and versatility is Rain Design’s $50 iSlider.